Strawberry Jam A truly authentic replication of traditional strawberry jam, made to be sweet and sat..
Raspberry eLiquid by Just Jam takes the raspberry flavour from their other juices in the range to be..
Jam Scone e-liquid encapsulates the quintessentially British taste of freshly baked scones. Warm, bu.. 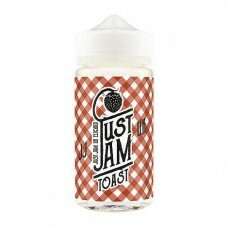 Strawberry Doughnut by Just Jam is sugar coated doughnut combined with a sweet strawberry jam fillin..
Lashings of sweet and delicately tart strawberry jam, smothered over warm buttery toast. Jam on Toas..